Every now and then, I come across a story about a brand that combines great products and passionate employees to deliver an excellent customer experience. A commitment to customers and employees is what differentiates many great brands. Zingerman’s is a family of food, cafe and gourmet businesses in Ann Arbor, Michigan. Zingerman’s was founded in 1982 by Ari Weinzweig and Paul Saginaw. 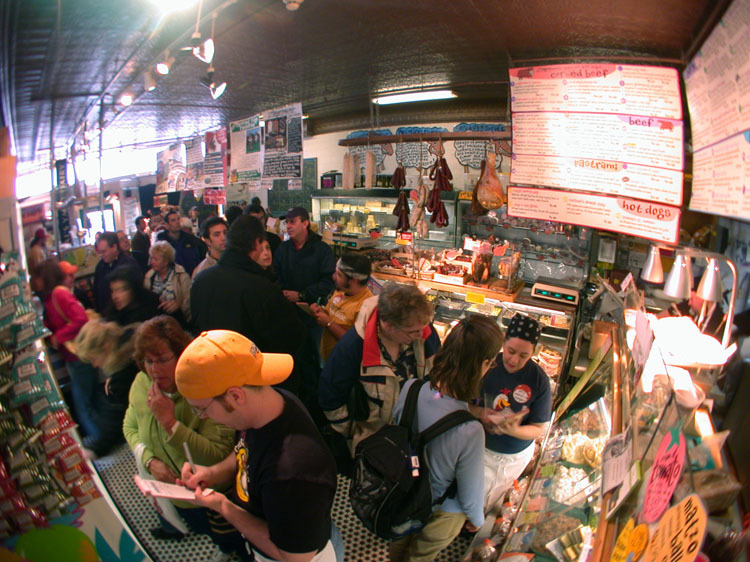 Zingerman’s started as a small corner deli. The founder’s were disappointed that they had to drive to Detroit to buy a good sandwich. Their goal was to replicate a great New York deli in Ann Arbor, Michigan. What they created is one of the most respected customer service models in all of business. The founders decided to offer “outstanding food” with unparalleled service to make customers feel valued. At its core, the brand is built on the idea of being nice to people and telling the truth. From the beginning the founder’s wanted just one store. They wanted a unique place that wasn’t just a replica of somewhere else. To anyone who visited the deli, Zingerman’s stood for great-tasting sandwiches, long lines, cramped seating, great service, and prices double what they would pay for a sandwich nearly anywhere else in town. Despite the impact on their pocketbooks, over 500,000 customers flocked to Zingerman’s Delicatessen each year to take in “the Zingerman’s experience” – an experience based on the food, the service, and the experience. Over the years, Zingerman’s regularly won accolades for its food, service, mail order catalog, training, and overall success. In 2004, Food & Wine magazine rated Zingerman’s among the 25 best food markets in the world, one of only two US locations on the list. Inc magazine highlighted Zingerman’s as one of “The coolest small companies in America”. Zingerman’s success is a combination of great customer service, open book management and a unique business model. The Zingerman Brand has grown to $46 million in revenue with eight businesses including a full-service restaurant, bakehouse, cheese making operation, coffee company and mail-order business. Zingerman’s believes in the passion and spirit of the business more than the bottom line. One of their keys to success is that they teach their employees about the business, which increases their buy in to the brand. The management team developed a plan to foster growth and yet be true to the company’s guiding principles of never expanding by copying the deli concept elsewhere. It would do that by providing opportunities for ownership in the brand to the people who worked for the company who were entrepreneurial and had passion for a given product or service and could come up with a compelling business plan and vision. That was the birth of the so-called Zingerman’s Community of Businesses. None of the individual businesses would replicate the other businesses under the Zingerman’s umbrella, but all the businesses would be customers and suppliers within that community. It has also launched ZingTrain which educates and trains other businesses on creating cultures based on customer service and employee value. Each business has shared ownership between original founders Paul Saginaw and Ari Weinzweig, and the managing partners who started each business. Each business has its own organizational structure yet they are expected to carry out the same standards and commit to the company’s values and mission. Zingerman’s has a great mission statement and guiding principles that are easy for employees to be passionate about. “We share the Zingerman’s Experience Selling Food that makes you happy, Giving service that makes you smile. In passionate pursuit of our mission showing loving and caring in all our actions To enrich as many lives as we possibly can”. Can you think of any other brands that deliver a great customer experience?